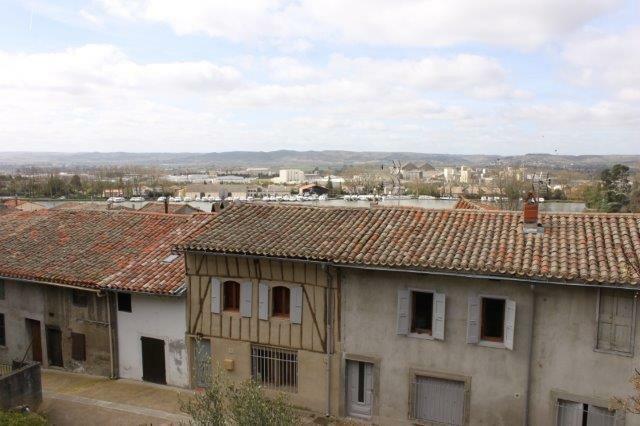 A recent visit by friends prompted an outing to Castelnaudary, a market town between Carcassonne and Toulouse. 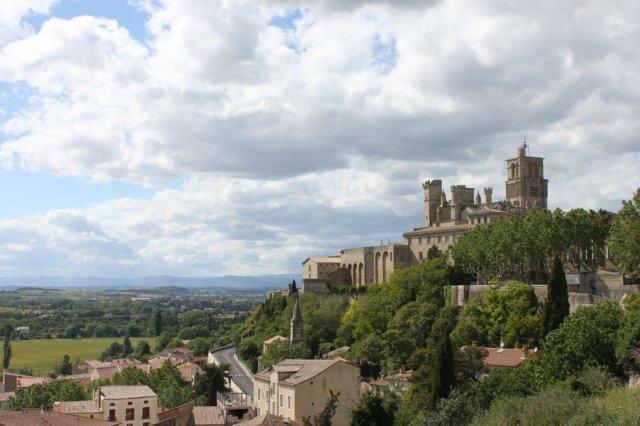 You might have come across the name of the town in connection with cassoulet, which is undoubtedly the region’s most famous dish. 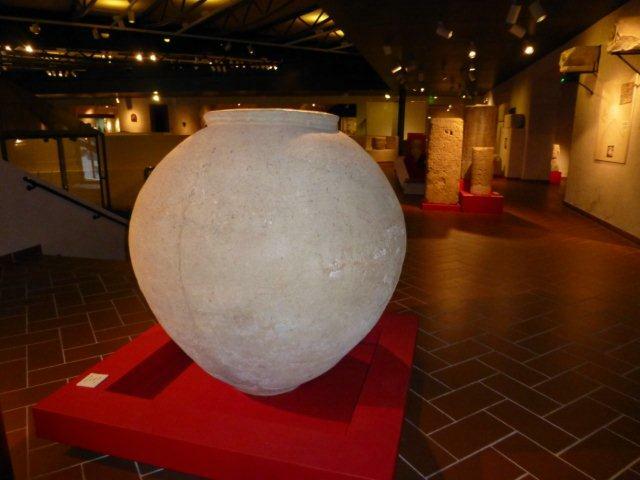 Castelnaudary is the capital of the Lauragais region, an area which has been called the granary of the Languedoc, because of its large output of wheat, maize and other cereals. 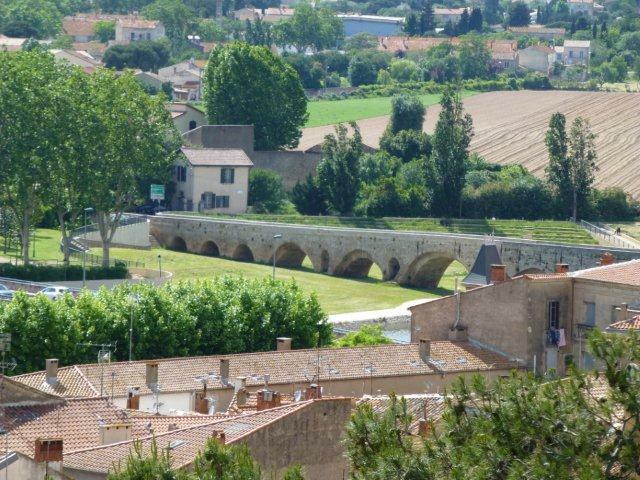 History was made in Castelnaudary when the Canal du Midi was inaugurated here in 1681. The town elders had the good sense to pay to have the canal come right to the town. Pierre Paul Riquet built the Grand Bassin below the town walls, an expanse of water 7 hectares large – that’s 70,000 square metres or 17 acres!! 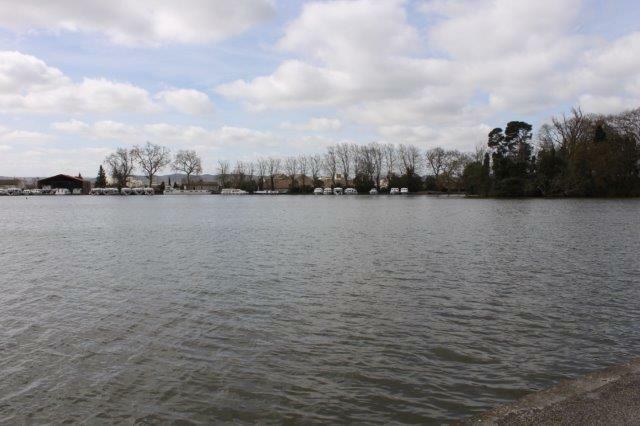 It is the only man-made lake of its kind on the whole Canal du Midi, and it was important for the economic development of Castelnaudary in the 17th century. Today the Grand Bassin is a pleasure port. It was still early enough, so we went on the walk to discover the town. Our first stop was on Place de Verdun. We couldn’t miss the market halls, which occupied centre stage on the square. To one side of the market halls was a tall building, with an incredibly ornate facade. 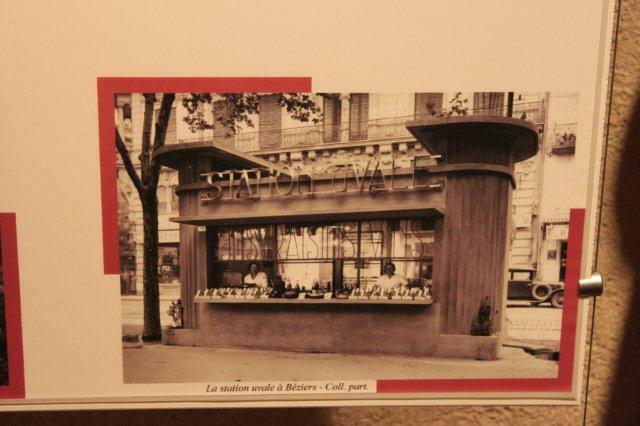 The brochure explained that this used to be the Grand Bazar, an offshoot of one of the first large department stores in Paris, the Bazar de l’Hotel de Ville. 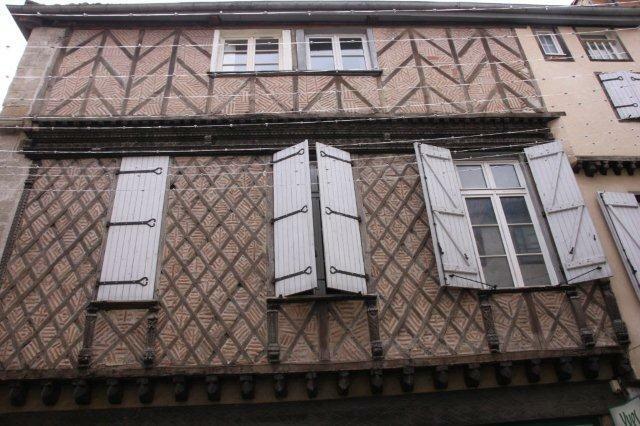 The Castelnaudary store was built in 1874, and whoever designed the facade certainly had fun!! We walked along the water to the Pont Vieux, the old bridge, passing a charming cottage, and the remains of an old mill. When we got to the bridge we got a good view of the Petit Bassin on the other side of the bridge. 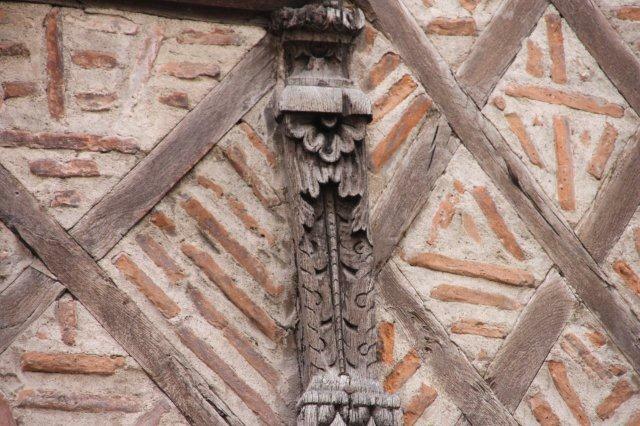 A lot more architectural detail on the way to one of the restaurants on my list. I hope I am not boring you, I just love all those wonderful buildings! The restaurant, La Belle Epoque, looked nice enough, with tablecloths and napkins – almost too classy for a cassoulet restaurant. What made us decide against it? There were hardly any guests inside, and from the outside it looked a little too starchy. Perhaps we were totally wrong. I will give it a try on my next visit, and I’ll let you know what it was like, I promise! So we headed back towards the Place de la Republique. 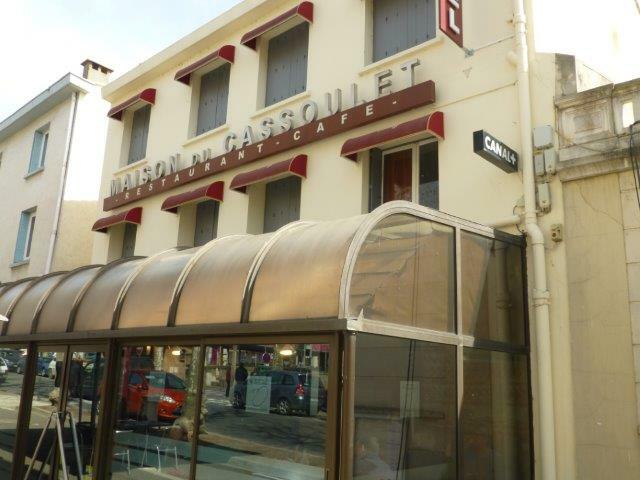 La Maison du Cassoulet, the other restaurant on my short-list is just to one side of it, right next door to the town hall. 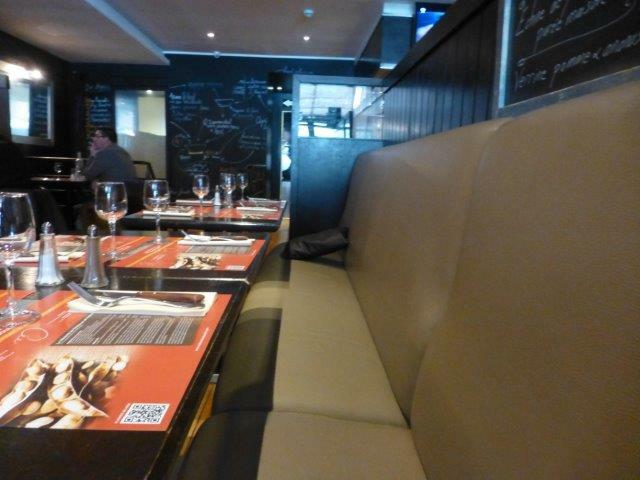 The restaurant was busy, the decor pretty modern and the seats comfortable. The place mats had a recipe for cassoulet printed on them – perhaps the one they use in the restaurant? The waiter was kind of intimidating, so I didn’t bother to ask. However, the cassoulet more than made up for our disappointment over the fries. The beans were beautifully flavoured and perfectly tender, without falling to pieces. I recently read an article where the writer could taste “a bouquet of forests, meadows and succulent meats” in her very first bite of cassoulet. The meats in my cassoulet were certainly succulent, but forests and meadows? Seriously? The serving was a perfect size. It contained a piece of preserved duck, two kinds of sausage, and a piece of pork, along with the beans. 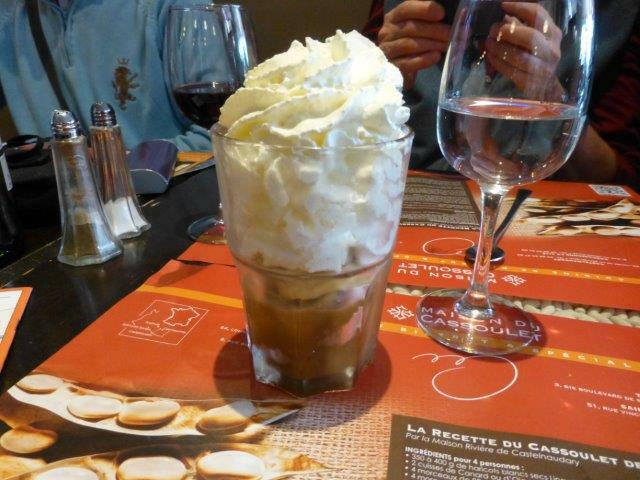 We all managed to finish our portion, and have a little, although it was very little, room for dessert. Mine was a “de-constructed” banoffee pie. Wickedly delicious!! 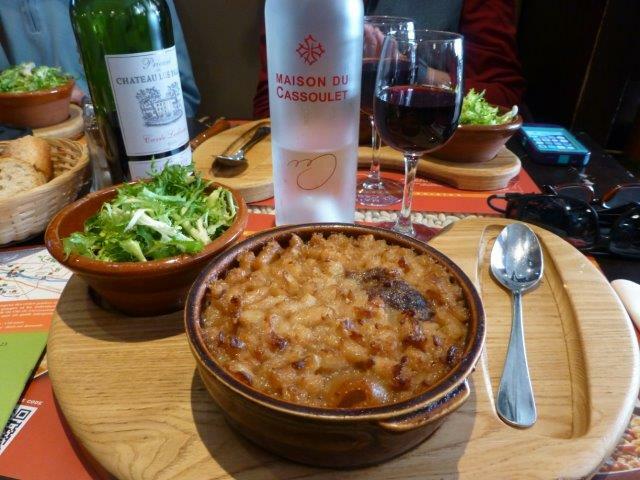 La Maison du Cassoulet does have its own website here, as well as branches in Carcassonne, Toulouse and Saint-Lary Soulan. 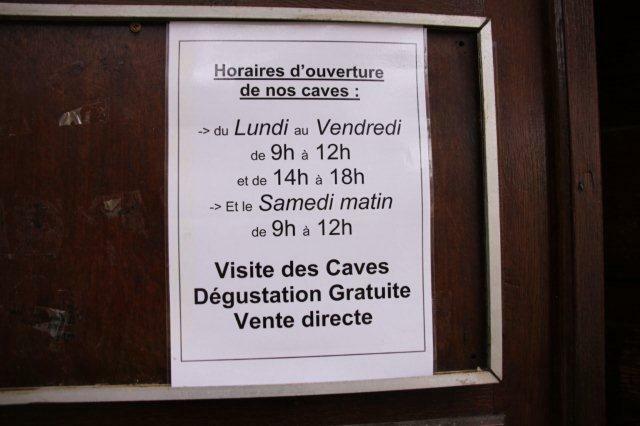 I Imagine that it can be busy in the summer months, so a reservation is probably a good idea. If you want to have your cassoulet AND eat it (at home), you can buy the tins and a dish to cook it in! 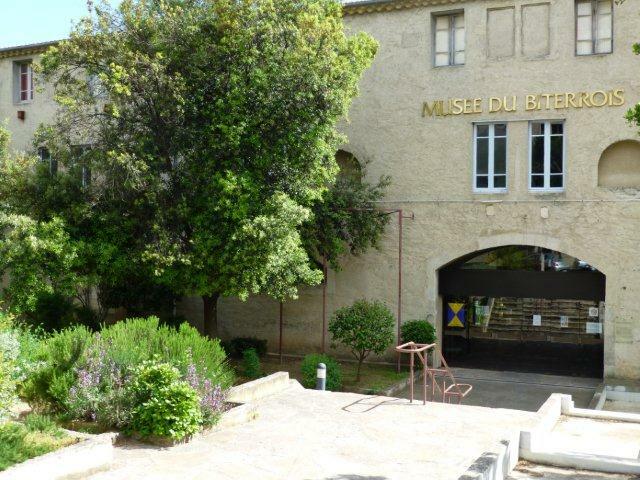 Beziers has several interesting museums, and I recently visited the Musee du Bitterois in an attempt to entertain my 15-year-old nephew, who came to visit during his school holidays. I’m not sure how successful the entertaining part was (YOU try and get some kind of feedback from a 15-year-old teen!! :-)), but I was certainly impressed by the museum. 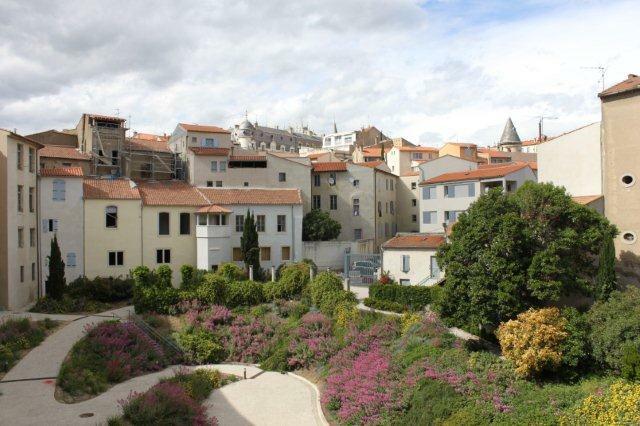 It is situated in part of the old barracks in the St Jacques neighbourhood of the old town, and the building itself is impressive, even more so on the inside. It’s all very spacious and well-lit, arranged around what was an open courtyard at one point, and which is now partly roofed over. 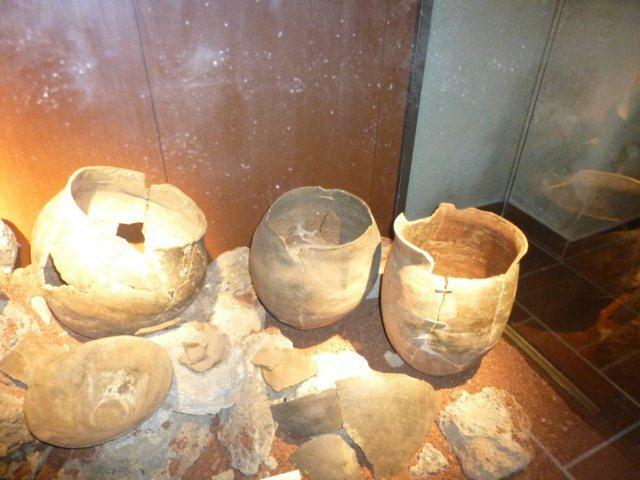 The exhibition is in chronological order, and starts with prehistoric finds. 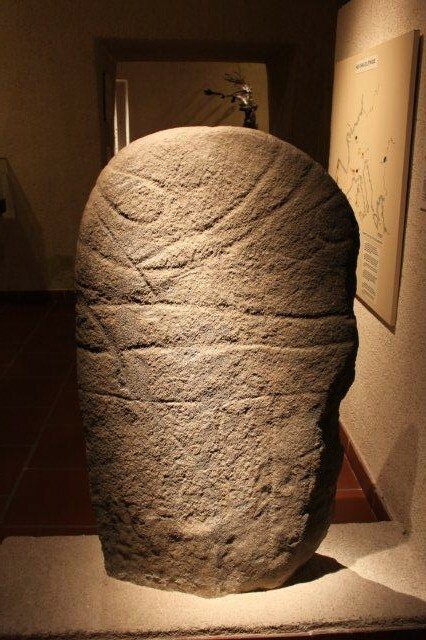 I was particularly impressed by this beautiful menhir and the prehistoric burial urns on display. 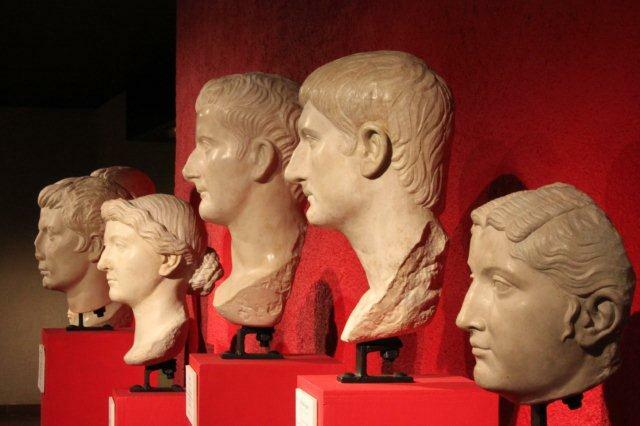 I get confused as to what belongs to which period – so if you really want to know you’ll have to visit. 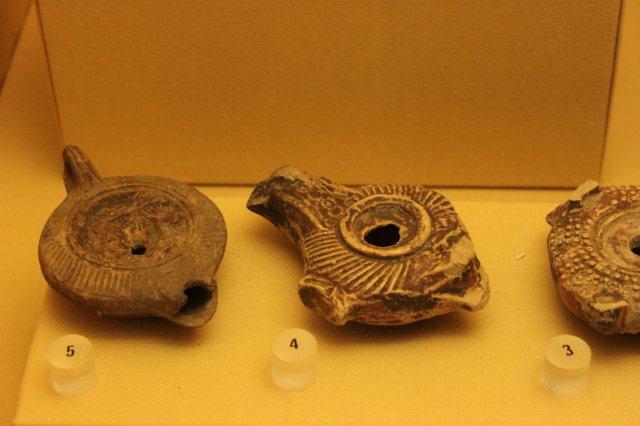 The most ancient artifacts were juxtaposed with modern art – an interesting concept! 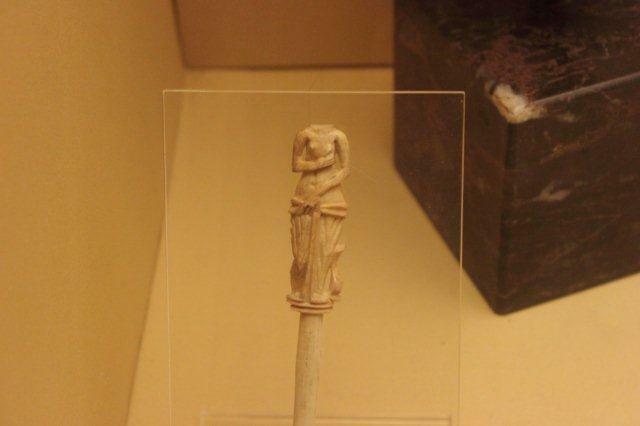 but also this exquisite carving, which I think is ivory. It’s tiny and except for the missing head it’s perfect. Then there were these enormous stone blocks with an inscription which I’ve not yet been able to decipher, despite using google translations. 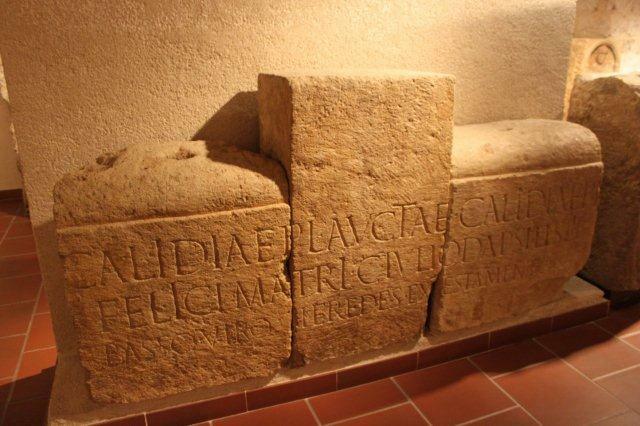 Something to do with hot mother’s milk making you happy, and male heirs, but most likely I have that totally wrong, Latin was never a strong subject for me :-). I couldn’t find a description for that particular exhibit, otherwise I could have told you what the inscription really meant. But this way we can just make it up as we go along. 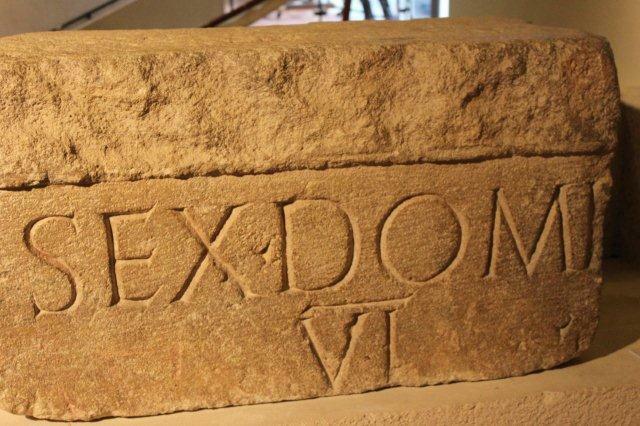 And then there was this rather racy sounding inscription, but I think it’s something to do with six at home (?? ), and of course most of it is missing, so who knows?? After all that Roman stuff the exhibition got to the medieval period, which meant a fair amount of religious art, and there was a fine statue of a headless St Aphrodise. 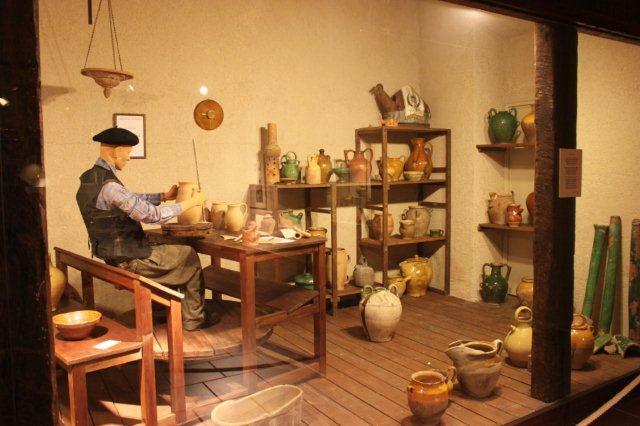 Finally we arrived at more modern times, and there was a charming reconstruction of an Auberge along the Canal du Midi, along with the workshop of a last potter of Beziers. 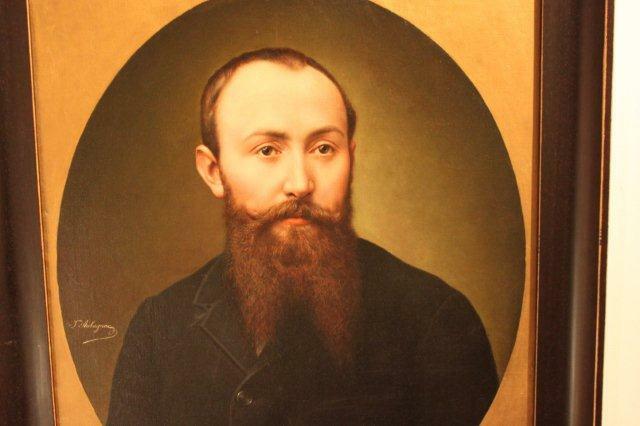 The revolt of the wine growers was well documented, and the portrait of Ernest Ferroul caught my eye. He seems to have been very active in the movement, but was also a very shrewd politician and changed allegiances frequently – sounds familiar? The Station Uvale looks very much like an art deco ornament. By the looks of it everything do with grapes was being sold there. 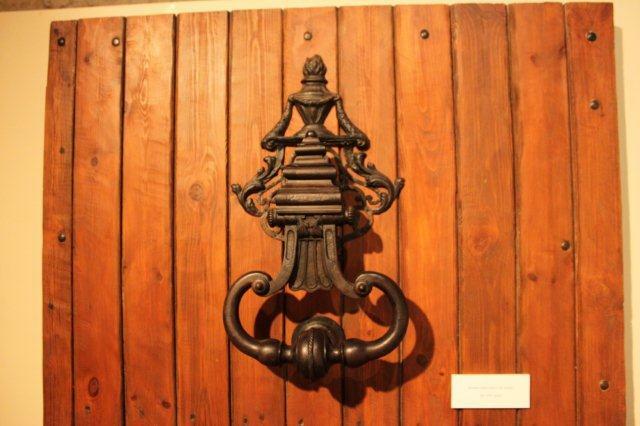 And here is yet another door knocker, this one made by a Mr Cordier towards the end of the 19th century, and pretty monumental in size!! 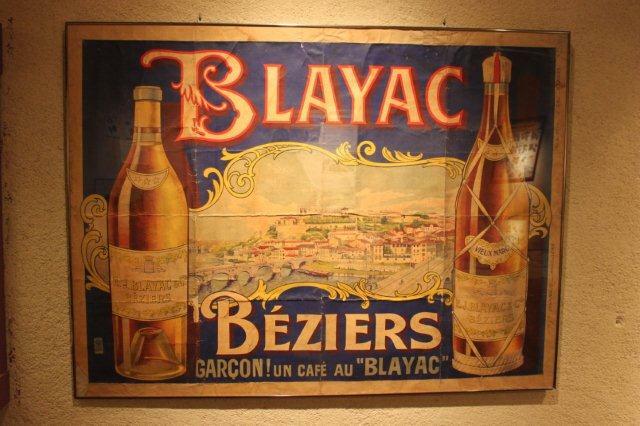 Beziers’ industries were many, and this poster for Blayac brandy is particularly colourful. I’ve not been able to turn up any information about the factory or the brand, but the name Blayac is still very common in Beziers. 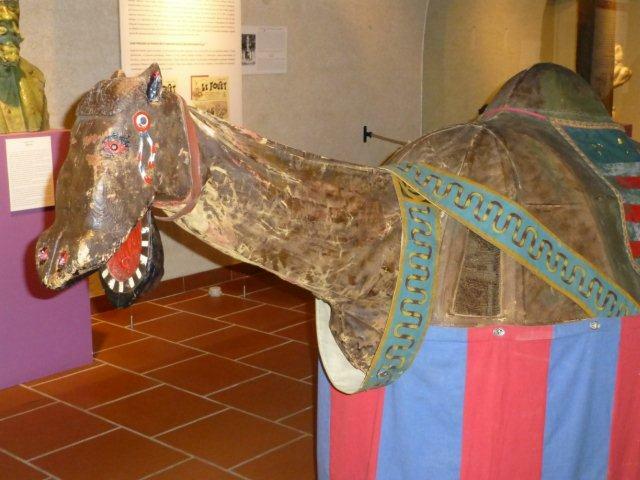 And here’s another representation of the famous camel (see the post about the occitan carnival) . It’s somewhat smaller than the camel which is taken out for the processions, but it has a very jolly face! 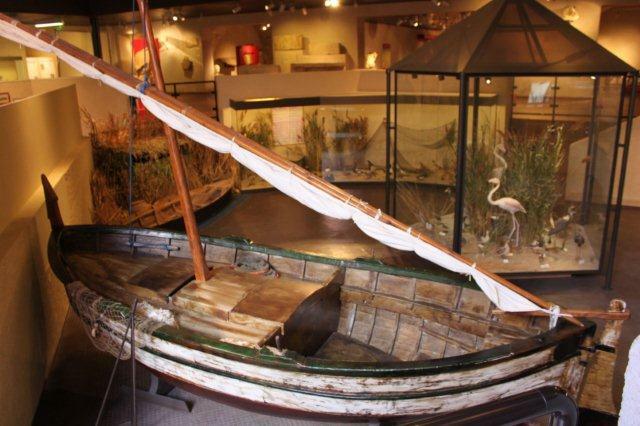 And finally, the old boat in the sunken exhibition space of the museum, along with the display cases of local fauna and flora. Fancy a little cruise? The St Jacques neighbourhood surrounding the museum is pretty interesting too, full of old buildings and quirky details. 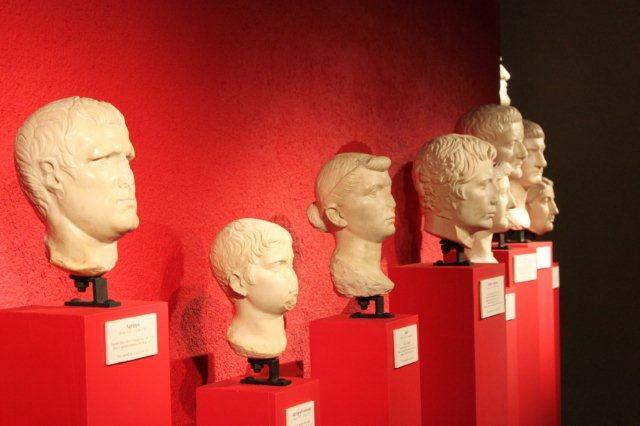 One of the more interesting things to see is the site of the old Roman arena, which was completely built over after the fall of the Roman empire. 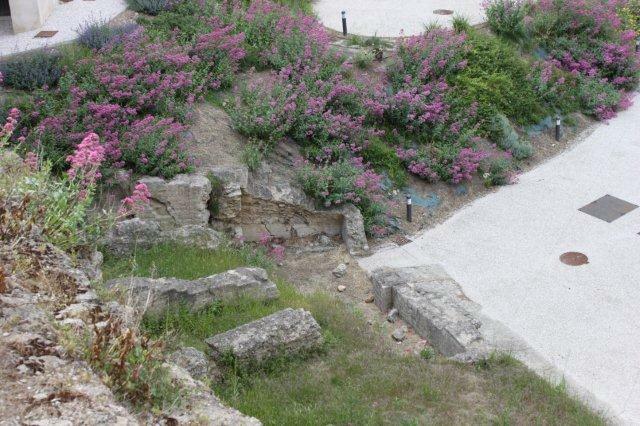 At some point during the past 20 years, the municipality decided to consolidate the remaining walls and create a small park open to the public. 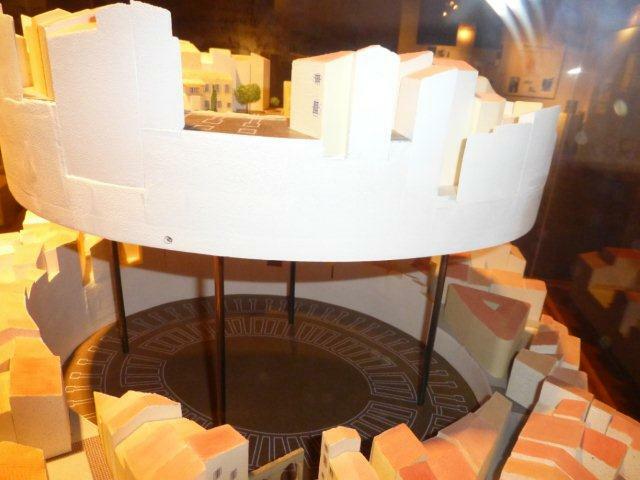 The museum has a hand-cranked model of the site, to give you an idea of what there was/is. And there you have it, an exploration of another small part of Beziers, full of history and interesting nooks and crannies. Thanks for joining me! 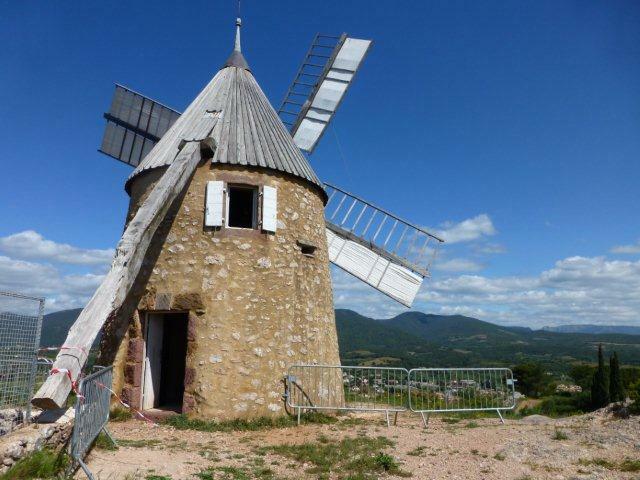 First of all my apologies to everyone who was looking forward to the follow-up post about the windmill in Saint-Chinian. I got so carried away after my visit to Gruissan that I just had to write that post about the salt! 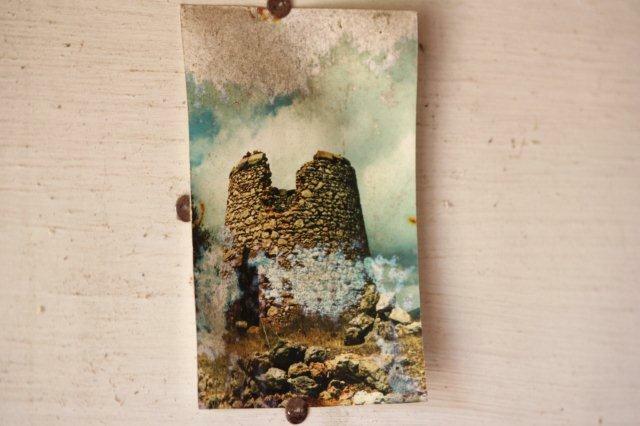 Until about 12 years ago, the windmill of St Chinian was all but a distant memory and a romantic ruin. 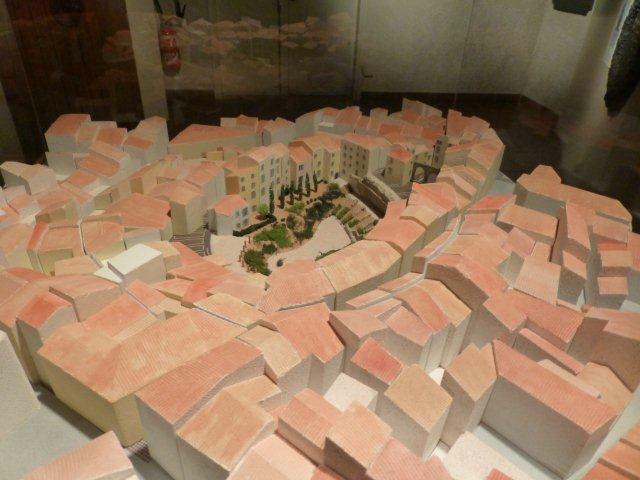 Then someone on the town council had the idea to rebuild and restore, and up it went. Now the windmill once again proudly surveys the valley, and at least once a year it is put to work. It’s pretty spectacular to watch the mill crank into action, both inside and out!! Space inside is somewhat tight, but on the first floor I got a good view of the workings of the mill. The drive shaft which is connected to the sails must have been a massive oak tree! 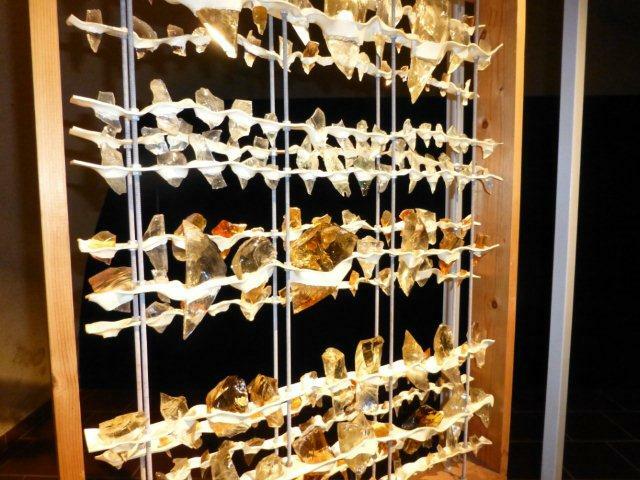 The craftmanship is superb, and it all functions beautifully! Unfortunately the wind was not very even, so the mill would start and stop. 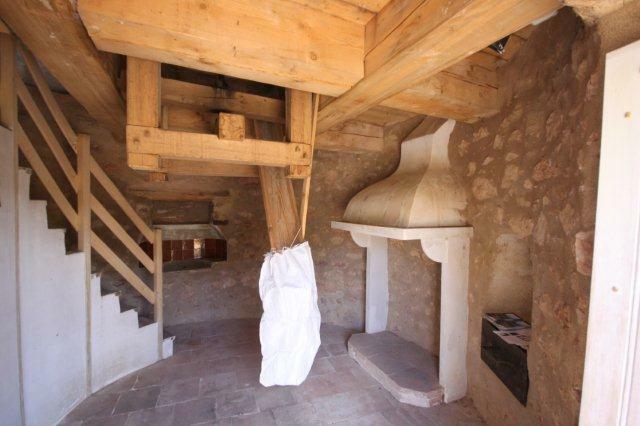 The wooden “hat” can be turned so that the sails face the wind head on, and all the mechanisms including the millstones are located on the first floor of the mill. The miller had to carry up all the sacks of grain and the flour would arrive by a chute on the floor below. 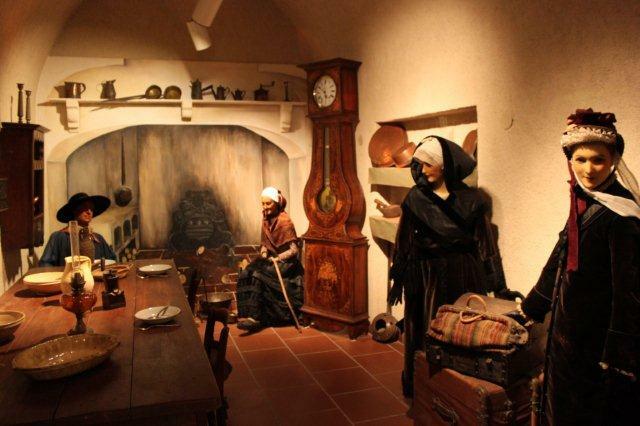 On the ground floor the miller had a small fireplace, despite the fire risk, to keep warm and to heat up his food. When the mill was turning there was no way of leaving it unattended, anything could have happened, so I guess you couldn’t blame him for wanting a few little comforts. 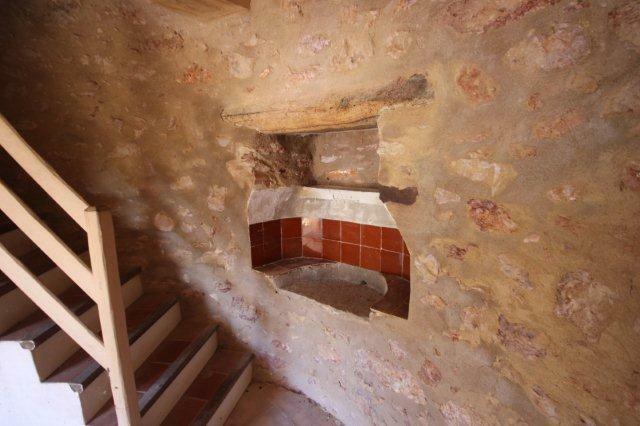 There’s also a small sink set into the wall – was that for washing up after meals?? Can you find the chimney for the fireplace on the outside of the mill?? I’ll give you a clue – it does not come out through the roof. 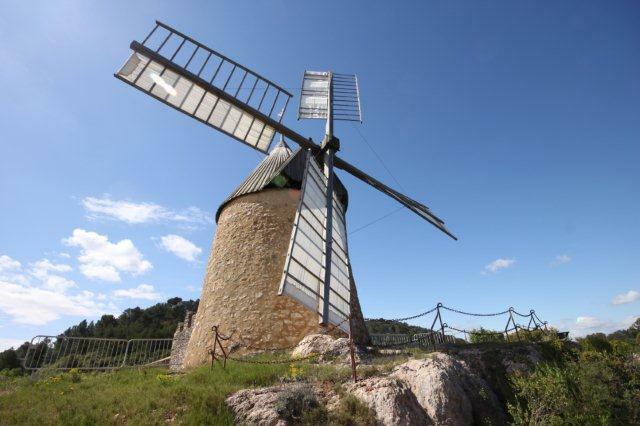 When you come to visit St Chinian be sure to stop by the windmill. 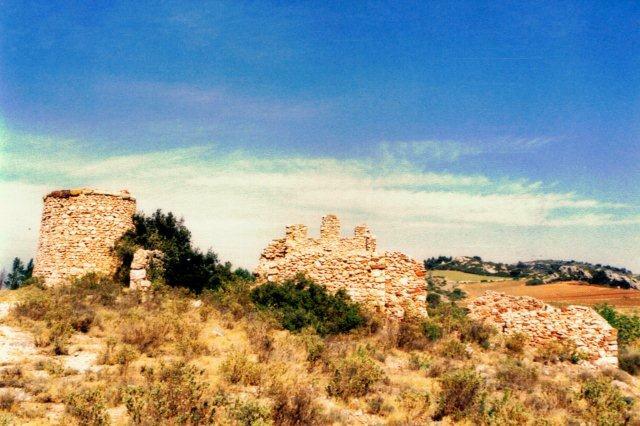 The views are superb, and it’s also the starting point for a walk called the sentier des capitelles. The walk is well worth doing and I’ll write about it in another post, promise! 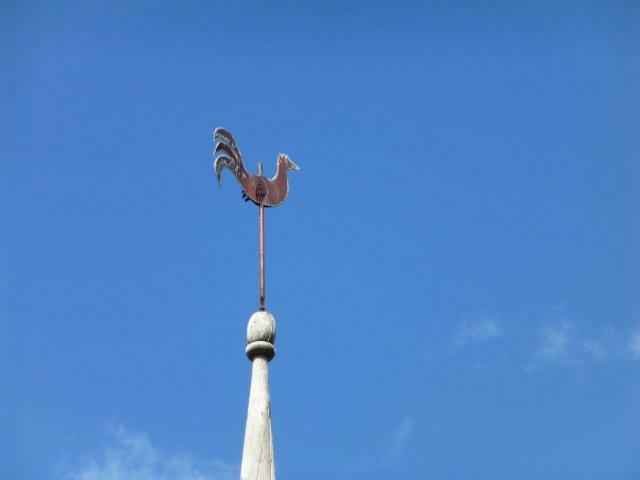 I hope you’ve enjoyed the guided visit of the windmill! 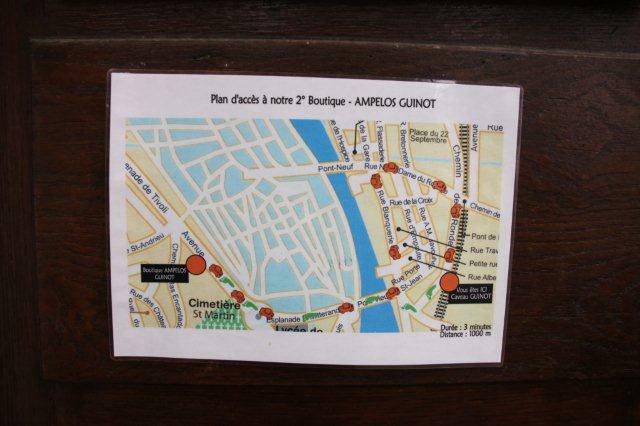 Earlier in the year I visited Limoux to experience the famous carnival. 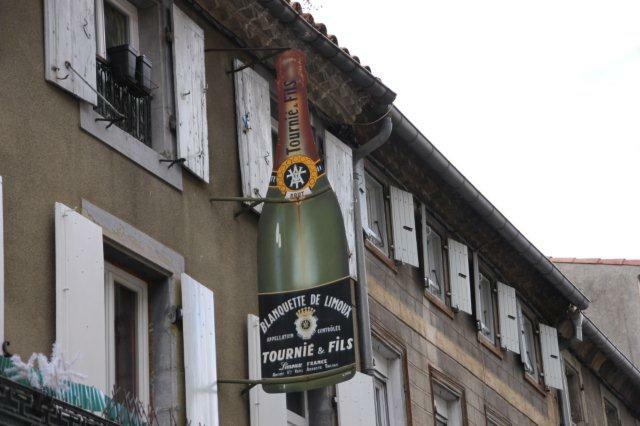 But Limoux is a town worth a visit at any time of year. The reason? A great drive, some wonderful architecture, AND sparkling wine! Legend has it that sparkling wine originated from the Abbey of Saint-Hilaire near Limoux and a first recorded mention of sparkling wine dates from 1531. 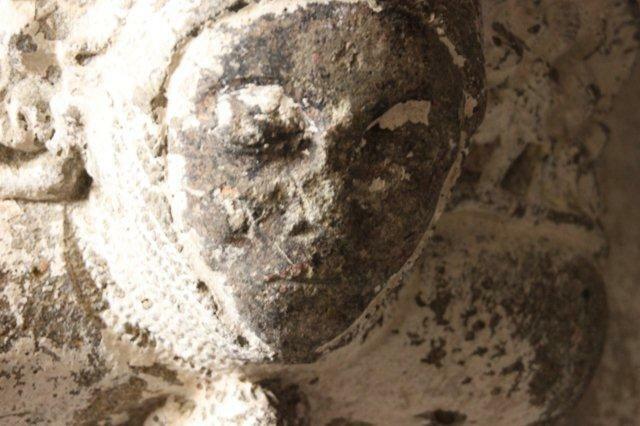 The legend goes on to say that towards the end of the 16th century Dom Perignon stopped by the Abbey of Saint-Hilaire on a pilgrimage, and found out the secret of how to get the bubbles into the bottle, which he then applied to the wines in Champagne on his return there. But I digress. 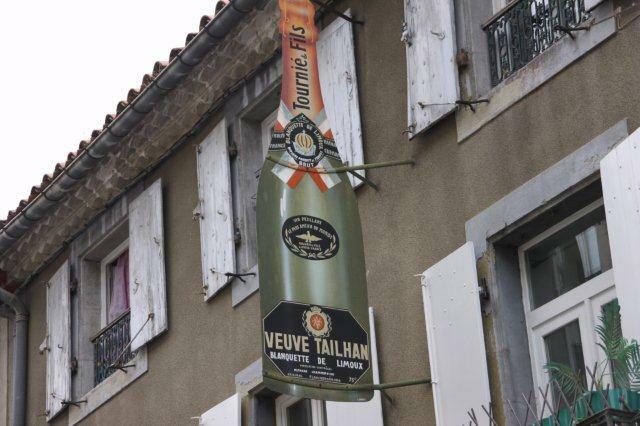 Limoux is along the banks of the river Aude, with the larger and perhaps older part on the west bank. At the top of Rue Jean Jaures, where you enter the old town proper, are gate piers, nicely reminding me of the fortified walls which would have been here at one point. As you walk down this road towards Place de la Republique you pass some beautiful facades such as this one. 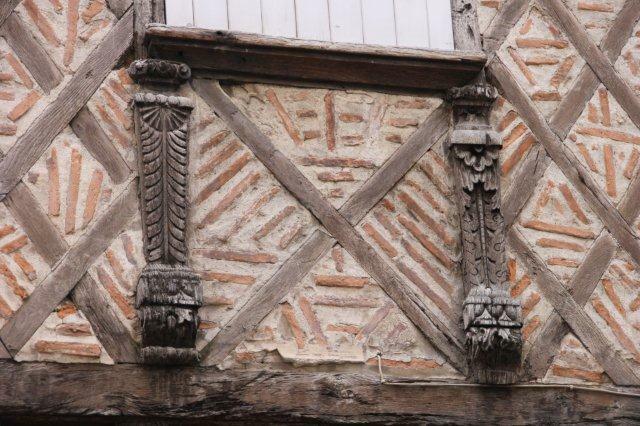 This house must be ancient,yet the carvings are still crisp in most places. There was also a great shop window, and I have a feeling that they probably keep it going for some time! 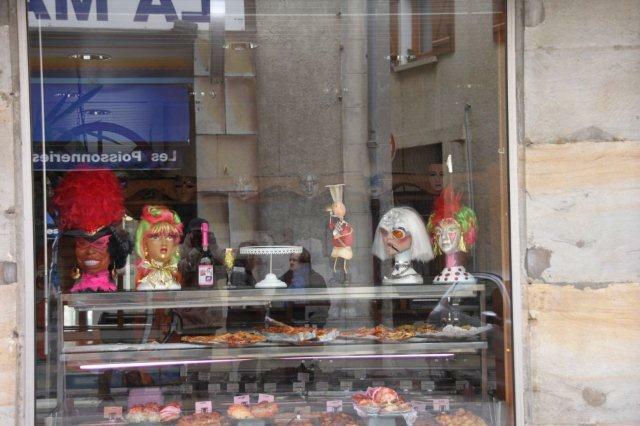 The people in Limoux really live their Carnival, and work on it year round! Place de la Republique has arcades around three sides, which you can see in my Carnival post. 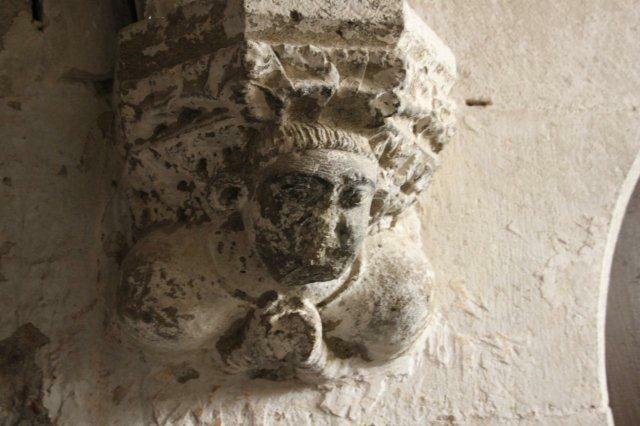 Just a few steps from there is a church, which has been made over many times, but I found some interesting stone carvings in one of the side porches. I wonder how long these guys have been there? Walking through the narrow streets turned up a fair few interesting things. I guess the imprisoned door knocker was to stop kids from playing with it? Those iron grilles with the stylised cockerels are just amazing and I couldn’t pass by all those door knockers without taking a picture :-). Recognize that house? 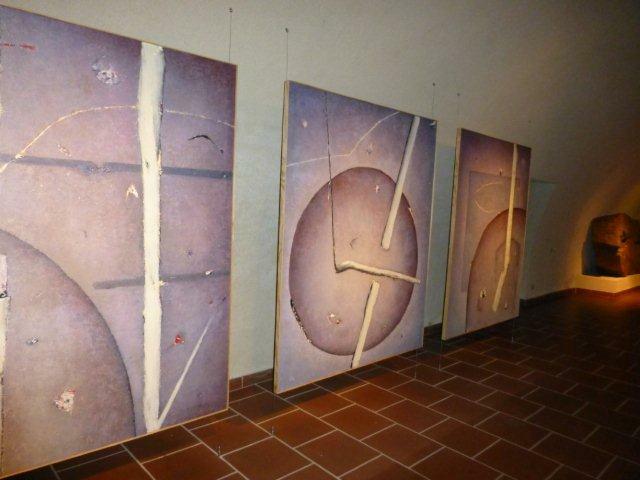 Have a look at the second picture in this post, this is the reverse of the sign. 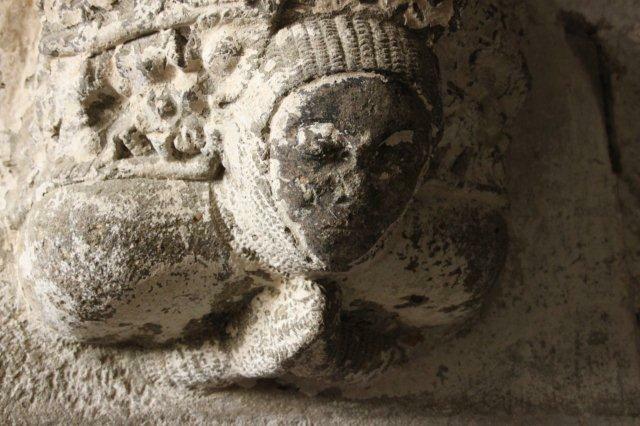 Widow Tailhan on one side and Tournie and sons on the other – I wonder if they were related? 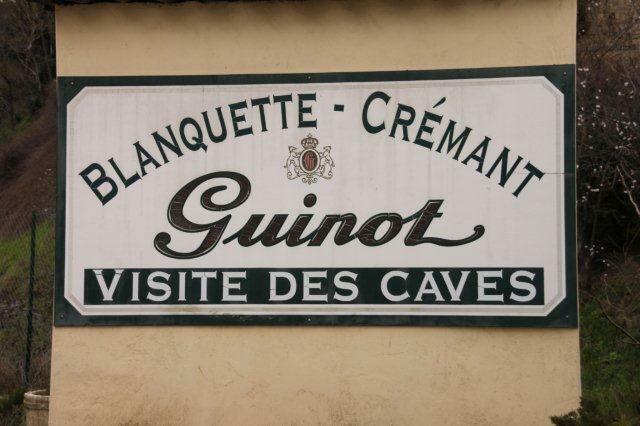 After the walk I headed for the east bank of the river and to Maison Guinot – the oldest Blanquette house in Limoux, established in 1875. I first came across this producer back in 1998, when I bought their Blanquette for a birthday party, and I’ve been back a good few times since. If you want to find out more about the technicalities of what goes into Blanquette there are good articles on Wikipedia in English and French, the latter being the more exhaustive of the two. 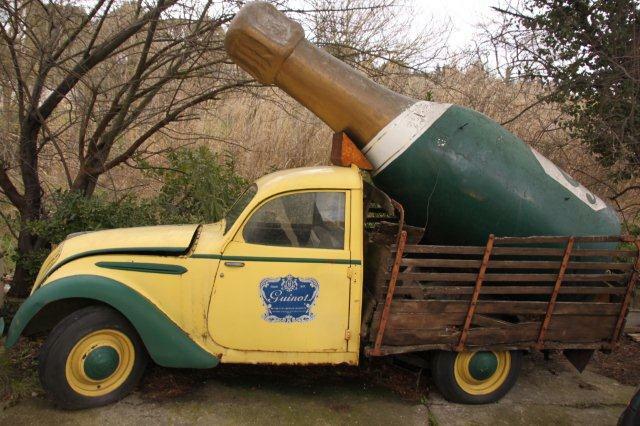 Of course alcohol should be consumed in moderation, and please don’t drink and drive!